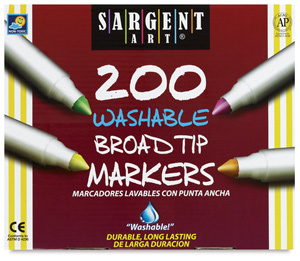 Great for school, home, or office, these durable markers come in a variety of vibrant, long-lasting colors. They are non-toxic, with a child-safe breathable cap, making them ideal for smaller children to use. This convenient class pack contains 200 washable markers, 25 each of Black, Blue, Brown, Green, Orange, Red, Violet, and Yellow.